Own your worth, lose the hustle! The first time I heard someone use the word “hustling” in the business world, I thought that’s interesting, what exactly does “hustling” mean? Like most people, I’ve become quite friendly with Google to help me understand words and phrases. So here’s what Google said about the word hustle . It comes from the Dutch word hutselen which means “to shake or shove”. It could also mean “to sell aggressively” which is the context in which my business associate used it. This got me thinking about how hustling has become part of our lives especially on social media platforms like Facebook, Twitter, Intagram etc. These platforms have opened the door to a world of hustle like never before. Celebrity hustle has created a culture of it’s own, “ aggressively selling” everything from products, stories, status updates and pics. It’s easy to get caught up in this culture on social media and fall into the hustle because it’s everywhere, in your face, 24/7. But we are not only at risk of getting caught up in the hustle on social media platforms or in business. 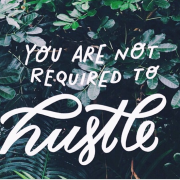 There’s another kind of hustle which I’m starting to see in my coaching practice as I coach and mentor more and more women. This hustle is underpinned by our beliefs about our worthiness and it drives the way we show up in our relationships across the board. Although it appears to be evident in boss/co-worker relationships, it seems that it is more prevalent in romantic relationships, parenting and friendships. Hustling in relationships is done unconsciously without us even knowing that we doing it. When we believe that we are not enough or unworthy, we hustle for our worthiness. In the dance of hustling for our worthiness, we over-give, we perfect, we compete, we people-please, we compare, we perform and we constantly trying to prove that we are enough. Worthiness is our birth-right. But somewhere between the day we were born and today, we’ve learnt that in order to have value and worth, we must appear to be perfect in all things. And because perfection is an unattainable goal the hustle begins and the dance keeps getting faster and faster. If you are in a situation where you are ‘hustling” for your worthiness, chances are that you are pointing a finger outward and blaming someone or something for “making” you feel unworthy. You’re looking outside of yourself for someone or something to make you feel worthy when your access to worthiness can only be found inside of yourself. Allowing the loss, to accept the gain. Most of us want something for nothing. We want to be fit and healthy without exercising, successful without taking a risk, and loved without losing anything. This “all blessings, no burdens” idea of how life should be is very American, since America is the only culture in the world that seems to expect life to be comfortable and relatively pain free. We are so captivated by our collective myth of the happy ending, that we rarely acknowledge that in order to gain anything we need to sometimes lose something else. We simply never move forward in life without losing something. No wonder most of us are in resistance to change, even when those changes promise to be positive. Surrendering to change means letting go of being in control. Yet, as much as we want our lives to be different, the truth is, we don’t like it much when our illusion of being in control is challenged. 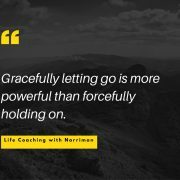 The feeling that we are in charge of our lives gives us leverage in our attempts to avoid the experience of loss. Yet, these efforts to circumvent loss are the very foundation of our excessive anxiety and worry. Many of us are suffering severe levels of angst in an attempt to avoid the natural order of life, which always includes periods of endings and passing away. One of the most important skills we can acquire in life is the ability to respond well to loss and disappointment. The first step in doing so is to give up the assumption that, when we suffer a loss, that something is “wrong”. Nothing is wrong. Loss is a part of life. Sometimes there is a sadness, a silence, a despair or a loneliness that just needs to be listened to. Our lives are always in motion. As such, we will continually be asked to give up the life we have for the life that we are creating. For those of us who’ve suffered traumatic losses, particularly ones that occurred in early childhood, the feelings that we associate with loss, such as sorrow, fear and frustration, can be unsettling and frightening. However, it’s important to learn how to feel these feelings without needing to numb out or act in ways that are hurtful and destructive. When you decide to improve your life, the first thing you will experience is loss. It happens all the time. You think that, because you’ve taken positive action,things should start to look up. Instead, very often, something strange happens. Things actually begin to get worse. That is because you have made a decision to grow yourself into a wiser, more-loving version of yourself. And that means that the “old” you has to die so that the “new” you can be born. The first act of creation is always destruction. In order to live rich and meaningful lives, we must learn to undergo the necessary losses of life without having to distract ourselves with drama, or be rescued from the unknown. We must learn to move forward even when we are afraid, embracing the very losses that we have been trying to avoid. For that is how we will transform our disappointments, our defeats and our sad tales into something valuable — a deepening of the soul, a growing in compassion, a leveling of false pride. These are the experiences that have the capacity to help us expand our ability to give and receive love.